Draynecs BVBA is a company specializing in cat litter. Late nineties, Draynecs BVBA was the first to introduce silica gel cat litter in Europe. Meanwhile, we export to several countries in the European Union. Over the years we have built a strong expertise in the field of cat litter. This results in several successful partnerships with satisfied customers. Clumping Vegetal Catlitter/Catokay Organic is up to 3 times more effective than ordinary cat litter, as moisture gets effectively absorbed in the capillaries of the natural cereal-based fibres. This makes Catokay Vegetal Catlitter/Catokay Organic very economical to use, and refills of the cat tray are kept to a minimum, because Clumping Vegetal Catlitter/Catokay Organic lasts longer in the tray. This is also due to its high odour-controlling ability, that takes out unpleasant smells. Naturally pleasant smell, with no artificial additives. May be composted, and is 100% biodegradable. 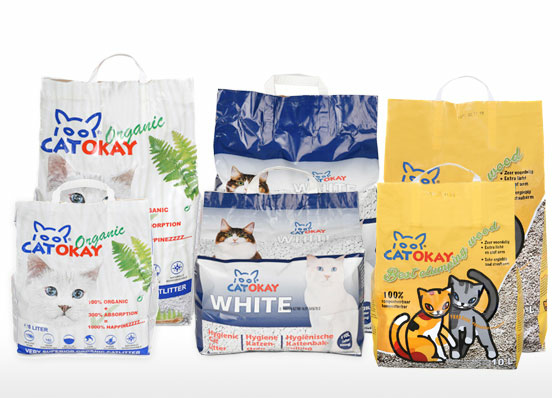 Clumping Vegetal Catlitter/Catokay Organic may be composed and is biodegradable. You may therefore empty the remains of your cat litter tray on the compost heap, or in your biological disposal bin ( please observe local regulations ! ). Remove clumps daily and dispose of them in the toilet. 100% pure cereal fibre. ... is made of the finest cereal fibres obtained from local sources. Can be disposed of in the toilet! Clumping Vegetal Catlitter/Catokay Organic is made of natural cereal fibre, which, as with toilet paper fibres, readily dissolve in the toilet bowl, and therefore do not cause problems either in the wastewater drains, nor at the sewage plant. Use plenty of water to flush. Cellulose Catlitter Standard is made of 100 % cellulose fibres. Thanks to their unique cell structure, cellulose fibres capture moisture quickly and permanently. This product is fully compostable and will rot away in 65 days. The parent material used for small animal pellets is based on wood sourced from sustainable forestry. The wooden shavings of the raw material are untreated and the pellets are pressed under low pressure to assure quick and entire absorption performance. The unique cell structure of cellulose guarantees that liquids are locked in fast and easily. This in combination with natural essences and a low ph-value constrains unpleasant odour development. Pellets are easy to handle and dust free to apply. Pellets for small animals are environmental protection in practice as they are produced of renewable raw material. Their origin allows 100% biodegradation, as they are untreated and without any chemical additives. Silica Gel completely absorbs liquid waste in seconds which inhibits bacteria growth and leaves litter dry to the touch. No messy clumps or satured clay,superior absorbency neutralizes liquid and solid waste odors. No dust and light weight. Catokay Best Clumping Wood is a good cat litter and that is crucial for sharing the same living space in harmony. For both – cat as human being - it is very important not to be exposed to unpleasant odour. That’s why a good hygienic performance of a cat litter is substantial. Key benefit of a good cat litter is the ability to build a solid lump within an adequate timing and a lump which allows a safe removal. Wooden clumping litter/Catokay Best Clumping Wood combines the features of a high performance cat litter with the advantages of a product that is based on naturalness and sustainability. After more or less 30 minutes a solid lump can be removed. The result is a hygienic cat litter box where no odour can evolve from used parts of the litter. And there is still the light and pleasant smell of wood in the air. In times of growing importance of sustainability the high position of a wood based litter/Catokay Best Clumping Wood is getting more and more obvious. Short transport of raw material sourced out of sustainable forestry is a real advantage for the production. The low weight of the Catokay Best Clumping Wood reduces logistic costs and eases the handling by the consumer. Being 100% natural allows composting and the additional usage as energysource within the disposal process. Wooden clumping litter/Catokay Best Clumping Wood is perfect and modern cat hygiene. It supports the responsible treatment of nature. Daily, remove clumps and solid waste. Clumps up to walnut-size may be disposed of by flushing away in the toilet. Larger clumps must be disposed of by composting or with domestic waste. Always observe local regulations on waste disposal. Activated Bentonite Cat Litter forms hard clumps when wetted,and is ideal for use as a cat litter. The clumps can be removed easily, leaving a clean litter tray just needing to be topped up. The tray remains fresh and free from odours. The majority of the bentonite is 100% sun-dried, using no fossil fuel in the drying process. Activated Micro Granule Bentonite Ultra cat litter is preferred to Natural Bentonite by consumers in mainland Europe. Draynecs BVBA introduced the silica gel cat litter as the first company in Europe in the nineties. This became a great success and we deliver it in many European countries. Draynecs BVBA also specializes in private labels. Quality is very important at Draynecs. Every day we monitor the manufacturing of our products. We only use natural materials that meet the highest quality standards. We try to produce as environmentally friendly as possible.